Just want clarification. Are you saying that Stardock shouldn't put resources towards keeping up with MS changes for Windowsblinds? I'll admit I'm a newb, so I'm not aware if there has been an official statement by Stardock stating they can't and will never be able to get Windowsblinds on par with working on Windows 10 like it did on Windows 7 and earlier. If they have, then I understand that is a losing battle; but Windowsblinds is what brought me to Object Desktop in the first place. I enjoy skinning my desktop experience. The more tweaks the better. If they can put forth a quality effort of bridging the gap with Windows 10, followed by perhaps reaching out to people who used to be designing enthusiasts, but no longer have interest due to stated difficulties; maybe Windowsblinds could be better than ever. Again, if I'm just not aware of any statements from Stardock about this, I apologize. I'm just of the opinion that it's a big reason for people to get Object Desktop. From what I understand, Microsoft has limited the access/ability to perform as much customization as they allowed in the past. They seem to make radical changes every update which further restricts things. This makes it nearly impossible for the programmers at Stardock to work around and provide as much functionality and reliability as has been present in the past. At some point the expenses of that outweigh the revenue gained from the product and it just doesn't make sense to keep dumping money in to it. There are a select few die hard fans still but the popularity of it has been on a downhill run for years now. Yes Neone6, either one of us could be wrong. Neil is the coding genius behind it and if he finds it unethical or could at some point be classified as hacking there would be serious repercussions. It doesn't take a genius to see the decline of popularity. Just look at the WB skins library. Well over 50% of the newer skins are pay-to-play by a select few people. Years ago you had new skins coming in on a daily basis with a few non freebies here and there. I get it... doing a theme is a time consuming task, but this ratio tells a lot of information of the future of it. Thank you for your responses. Also thank you to neone6 as well. What you both say makes sense; I just know I love Windowsblinds. Ethics can't be argued though. I sure wish Windowsblinds could somehow pick up and be developed, but if it can't, I'm interested to see the other new enhancements they have in store. I just hope it's as compelling to me personally. Like I said, I love Fences. The only problem is I consider that a functionality program and not an aesthetic one. Why not both? Money I guess. I'll take a Win10 with WindowBlinds with some limitations over Win10 with no WindowBlinds at all. I've never even bothered to install Old New Explorer and probably never will. Windowblinds still does a lot for Win10. Exactly,it's dreadful. It supposed to be other way around that people see nice skin/themes and then buy the Winowblinds. Since the master skin scheme introduced,the popularity of it has declined sharply,combined with desktop market shrinking dramatically at recent years. I agree. However there were many people making WB's years ago. Now maybe 6 or so active now making WB's on a regular. As far as Oldnewexplorer. I'm not telling anyone to use it. Just saying as a skinner if you make a WB on win10 you need it. Since the master skin scheme introduced,the popularity of it has declined sharply,combined with desktop market shrinking dramatically at recent years. I can't agree with this nothing personal. As I mentioned. Many years there were a lot of people skinning WB,s and many other programs. Now the people aren't either here on gave up skinning. As far as skinning shrinking because of the desktop market, I agree 100%. Ask the average young person what their favorite graphic program they most likely wouldn't even know what you are talking about. We were asked to comment on this thread. However no one replies with the real truth about things, especially Windowblind. As long as what we have still works I will keep skinning. DesktopX became more of a burden to keep working than it was worth too. Desktop market is not shrinking. Dell reports consistent increasing sales of desktops. Anything less is not for serious computing. That does not translate it would has more sales of customizing software. The customizing/Windowblinds is a niche market already,having master skins scheme is making it more smaller. I do think that skin contributors should be compensated for what they worth. It's double-edged sword that Stardock has miscalculated/not thinking through. How does having Master skins, make the market of customization smaller? Because they have to pay the themes they like all the time...........just imaged a new user go the WB gallery seeing 9 out of 8 are not free as of now,I do not think that encourage considering he/she is just start having the experience. Yes,there are tons of free skins over there,but I doubt as a new one he/she will has the patience to rummage the entire gallery looking for them at the first time. People would only willing to pay when they felt that's worth,when they found out that they have to pay again for skins/themes they really like,they usually just walked by. I am not saying it's wrong having master skins,or not having it would increase the sale of Windowblinds,but at least Stardock should do something make the scheme sustainable. The peak time is passed after Win7,since then it never be the same. I think you are looking at this all wrong Gaspershooters. That screenshot you put a link to in your post going to TinyPic on the word "now" merely shows the first page of tons of skins, you go to the next page and 5 out of the 9 are free, and the next page 6 out of 9 are free, then 3 out of 9 on the next, then 5 out of 9, etc. The problem is not the Master Skins, it is how the site presents these skins. Free skins and Master Skins should be in separate galleries, that way people can go to either gallery based on their preference. When you click that Explore link, there should be two links for WB skins, one for "Windowblinds Skins (Free)" and one for "Windowblinds Skins (Master)". Gaspershooters, being that you're not a Master skinner, you don't know what people are willing to pay, or not. We as Master skinners we have a complete run down of all our sales, and also we can figure out who is a non-member of Wincustomize, so when they purchase a Master skin, they don't get the member discount, so that that tells me that those are new people to Wincustomize, so, I can say about 80% of my sales are from non-members, and we as Master skinners know who's willing to pay for a skin, so I believe your premise is wrong. Granted, there are those that aren't willing/can't pay, that's fine, but there are more people buying skins than you think! Also, I try to upload a free skin, out of every three Master skins I make. First I've heard of the possibility, but should it come to pass that WB & IP are dropped from OD, I'll have no reason to renew thereafter. I agree with you 100%, I too would have no reason to solicit Stardock products. Free skins and Master Skins should be in separate galleries, that way people can go to either gallery based on their preference. Now there's an idea! I can see the benefit of that. I can also see that masters may miss out on sales because the person who isn't really "looking" to purchase a skin may not get exposed to the paid ones. It could go either way.. I would not renew my ODNT sub without WindowBlinds either, just saying. I mean, let's get real, folks. 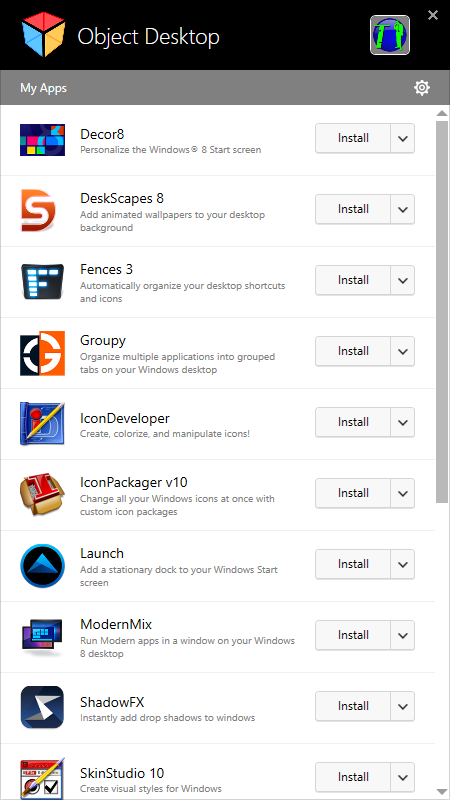 WindowBlinds IS and always was The Flagship of stardock applications. EDIT: I currently maintain 3 ODNT subscriptions. No WindowBlinds = No Renewals. Once genie is out,it's hard to put it back in. I said it before,it was not just master skins scheme is questionable,also the desktop market is down. You can be defensive whatever you wanted,fewer and fewer user of Windowblinds is undeniable. I agree with your opinion wholeheartedly! Segmentation of comoditized markets, such as desktops and laptops, says there are opportunities for Stardock and others...but, they have to be known to those who could be interested. I've had higher tier Microsoft support ask me about customizations on desktop and I direct them to Stardock. Stardock might even want to be on the Microsoft Store, just as it is on Steam. I wouldn't underestimate the interest in personal customization. It's not just desktops and laptops but devices. Not for everyone, but those who want a more personalized environment. That said, the issue of paying and how much is alive and well. The pay-for skins are often overpriced relative to what those amounts now buy in terms of software on computers and devices. Not saying what their selling value should be, but it's been noted in the Stardock newsletter that market pricing for software is way down...more commodity than ever. What management and marketing/sales see as opportunities withinin this reality determines where they spend development resources. But it's obvious from posts here that long-time customers are still interested in updates.